A Life of Sugar and Spice: Best Fluffy Gluten Free & Dairy Free Pancakes So Far! Best Fluffy Gluten Free & Dairy Free Pancakes So Far! I don't make pancakes at home very often, but when I do, I want light and fluffy and delicious pancakes. I could just buy one of the pre-made mixes from any of the GF Flour mix makers out there but I don't want to have both a box of flour mix and a box of pancake mix. I've been working my way through a 5lb box of Better Batter so I'm determined to use it instead of using mixes for all of my baked goods. I have made some pretty good pancakes and some pretty bad pancakes since going GF but never quite hit the nail on the head. I'm so excited that this morning I FINALLY found a recipe that works. You see, I kept google searching "pancakes" but this morning I searched "fluffy pancakes" and TA-DA! Presto, the first result turned out to be the winner. I have an All Recipes account and kept searching "pancakes" and could never find what I wanted. Lo and behold, add the word Fluffy and you find a winner. I used this recipe and substituted better batter, rice milk and earth balance. 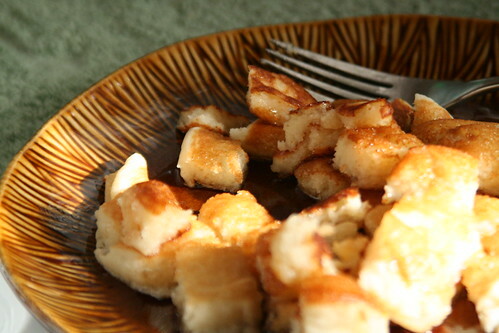 The faux butter milk (rice milk & vinegar) I think is the key to light and fluffy pancakes. The taste and texture of these is perfect. This is definitely the recipe I'll be using from now on! Darn, I made mine out of a box this morning! Your pancakes sound perfect for Christmas breakfast - I'll try your recipe then.